As an organisation that champions the rights of women and girls, CARE recognises the particular responsibility we have to protect people we work with from sexual abuse and exploitation. CARE works hard to empower women, engage men and boys to promote gender equality, and prevent gender based violence. We have powerful programmes and advocacy campaigns to advance these causes all over the world. As an organisation that champions the rights of women and girls, CARE recognises the particular responsibility we have to protect people we work with from sexual abuse and exploitation (SEA). Such abuse, of anyone, by any of our staff, is totally unacceptable. However, while it is completely contrary to our values and principles, we realise that no organisation is immune from a minority of individuals who abuse their position. Therefore, we have clear policies to investigate allegations, support victims and discipline perpetrators. What is the aid sector as a whole doing to address the issue of sexual abuse and exploitation? On 31 July 2018, the International Development Committee of the UK Parliament published a report on its inquiry into sexual exploitation and abuse in the aid sector. Bond released a statement on behalf of the membership, including CARE, outlining the sector’s commitment to creating a culture where people are able to report any safeguarding concerns. In October 2018, the UK Department for International Development held a summit in London on the issue of sexual exploitation, abuse and harassment in the aid sector. Ros MacVean, CARE International’s Safeguarding Coordinator, and Laurie Lee, CARE International UK’s CEO, attended the summit. Laurie Lee has also written a blog for CARE Insights, #metoo one year on, and seven myths that stand in the way of ending abuse. What is CARE doing to prevent sexual exploitation and abuse? CARE is tackling the issue at the recruitment stage. We need to prevent known perpetrators from moving from one NGO to another. CARE has put in place robust recruitment procedures that cover references and Disclosure and Barring Service (DBS) checks for all staff and volunteers. CARE has a number of policies in place including a global policy on Protection from sexual exploitation and abuse and child protection. This explicitly outlines unacceptable behaviour, and what we will do to investigate allegations, support victims and discipline perpetrators, including referring them to the relevant authorities. We also have a code of conduct that is signed by all those working with CARE International UK, including: staff, volunteers, trustees and consultants. We acknowledge that preventing abuse will takes more than policies – these policies also have to be put into practice. CARE is working hard to build a culture of prevention, in which abuse is not tolerated. We provide an induction to all new starters on safeguarding and have just completed a briefing for all line managers on SEA issues and in particular how to encourage reporting. What are we doing to enable people to report it, and to deal with incidents? This year CARE has been strengthening its reporting systems. We have a formal whistle-blowing policy that sets out clear guidance on reporting, protection of the whistle-blower, and how the report will be investigated. We know people are sometimes reluctant to report abuse or harassment. So we are focused and committed to creating a working environment at CARE where people feel safe to come forward with sexual harassment claims. We take reports extremely seriously and protect witnesses as well as survivors and those reporting. Reprisals against people for reporting are a breach of our code of conduct. We have established a range of routes for reporting concerns, including an anonymous CARE line which staff and anyone outside the organisation can use. Transparency is one of the ways to assure survivors that reporting will make a difference, and publishing figures is one very concrete way of being transparent. CARE is committed to publishing these figures on an annual basis. We collect figures in two separate categories: (1) sexual harassment, exploitation and abuse of programme participants and community members; and (2) sexual harassment, exploitation and abuse within the organisation. Who oversees our policies and makes sure we follow them? The Ethics and Risk Committee of the Board of Trustees of CARE International UK, as well as the whole Board, have regularly reviewed policy, practice and incident reporting of safeguarding. Urgent misconduct cases of any kind are shared with the relevant Committee Chairs immediately. Our Board recently undertook part of our Gender, Equity & Diversity training curriculum in order to consider some of the cultural issues behind sexual harassment and abuse. We offer direct contact to the Vice Chair of the Board for code of conduct matters relating to senior management, or if staff feel their concerns have not been adequately dealt with by management. 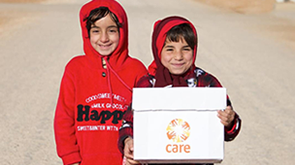 CARE International UK has a risk register, which is regularly reviewed and updated by senior management, the Board of Trustees and its Committees, including the Ethics and Risk Committee and the Finance and Audit Committee. Our risk management framework sets out our approach to risk and risk appetite. Each of our programmes has its own risk assessment. Safeguarding is a specific risk for our organisational risk register and for any programmes working with vulnerable adults or children. Our safeguarding policy makes clear that this applies to partners and contractors and reporting requirements. How does CARE address sexual exploitation and abuse through our programme and advocacy work? CARE is campaigning for an ILO convention which will push employers and governments to better prevent and remedy violence and harassment across all industries, including charities. We are proud to have been involved in advocating for this reform and will continue to push for real progress. CARE has a number of gender-based violence prevention programmes, which provide support and assistance to survivors. We believe that it’s also important to prevent violence from happening in the first place, which is why we also work with men and boys. This is a core part of CARE’s work to change attitudes to sexual abuse and violence, for example in our projects with men and boys in post-conflict communities in the Balkans and Rwanda.